Hip hop’s original hype man, Rapmania Tha X, like you all know is back at it again doing what he knows how to do best. Getting ready to put on his turn up beast mode activation for the premier edition of Maskhof. The event which is a mask party packaged with music performances, dance, comedy and interesting games. Mask usage is introduced to ensure secrecy at the event, whereby everybody seems to be anonymous. please note the party is not restricted to students only. Lots of music artiste, Comedians, and dancers will be performing live at the event. Venue: Bheerhugz Cafe, Leisure Mall Surulere. Tickets available at Yabatech campus, Unilag Campus, Hitbox (Leisure Mall), Bheerhugz Cafe (leisure Mall). 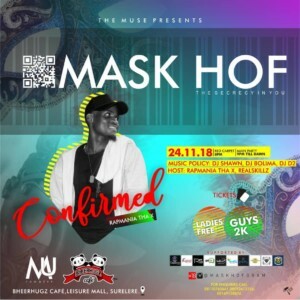 come experience the biggest mask party ever…. Maskhof is proudly supported by Bheerhugz Cafe & Classic city Media Entertainment. For sponsorship and adverts placements please call: 08110765661, 08169138626, 08093412356.